Hoffman Equipment is ramping up product support for Volvo equipment. When Hoffman Equipment's acquisition of Penn-Jersey Machinery became official on Nov. 19, 2018, it was the culmination of the usual back-and-forth business negotiations — maybe it'll happen … maybe it won't. That comes with the territory of major transactions. But now that the acquisition is official, Hoffman Equipment is moving full steam ahead with becoming the full line Volvo CE dealer for a large swath of Northeast territory. As a result of the acquisition, Hoffman has taken over Volvo CE distribution in the territories previously covered by Penn-Jersey Machinery and Malvese Equipment. Hoffman will assume Penn-Jersey Machinery's three locations — Deptford and Middlesex, N.J., and Lionville, Pa. — which add to Hoffman's existing locations in Piscataway, N.J. (its headquarters), and Medford and Bronx, N.Y. Hoffman also has a branch in Marlboro, N.Y., but the company will not be a Volvo CE dealer at that location. The deal made perfect sense for the manufacturer, Hoffman Equipment and most important, for Volvo customers. "Fortunately — or unfortunately — however you want to look at it, for the past year and a half of Penn-Jersey's existence, it was challenging for them and their customers," said Tim Watters, president of Hoffman Equipment. "The previous owner of Penn-Jersey is in a transition and the Penn Jersey business was challenged as a result and that had a huge effect on the quality of the parts support, service and operational support that Penn-Jersey could provide to their customers. Because of our own reputation, history and longevity in this market, customers that I have spoken to have all indicated that they are very happy that it was Hoffman that purchased Penn-Jersey. "Having said that, Penn-Jersey has a great team of people that have been hamstrung by their financial situation. Their technicians, parts team, sales team, management and administration are all tenured and professional people that know how to support our customers and are committed to making our customers' Volvo experience great…they know how to do it, we just need to get them the right resources and get out of their way." At the outset, bringing Volvo CE sales, support and service up to Hoffman Equipment standards has initially involved integrating the Penn-Jersey operations into Hoffman, Watters said. "We've moved our Williamstown [New Jersey] branch into Deptford [New Jersey] and then we're moving some of the Penn-Jersey employees from Middlesex [New Jersey] into our Piscataway, N.J., headquarters. We also have established our new Middlesex branch of Penn-Jersey as our Paving and Crushing Products — Center of Excellence." In addition, this has involved reorganizing and restructuring the service department, as well as hiring new employees. "We have hired a well-known Operations Manager at Lionville whose sole focus will be Product Support" Watters said. "And that move allowed us to realign some people and restructure our Deptford branch and they too will have an Operations Manager who will also have a laser focus on Product Support. 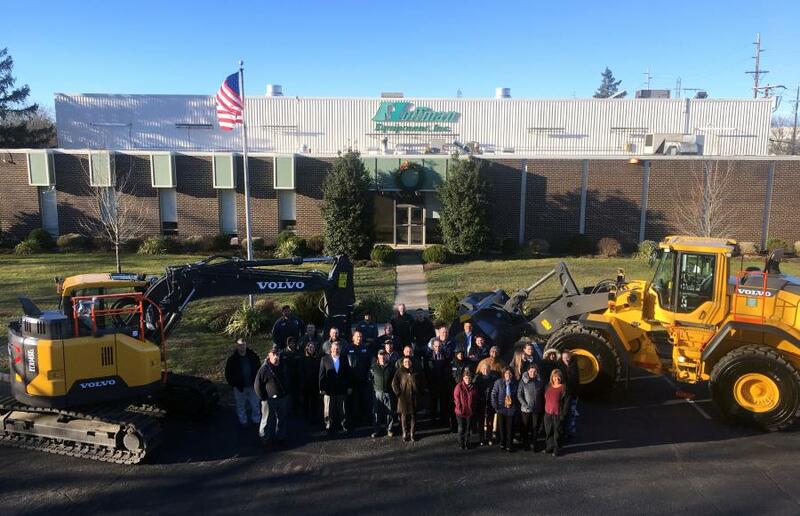 Finally, we have moved the Volvo Earthmoving Operations into our Piscataway office, allowing our paving and crushing specialists to focus on their customers from our Middlesex location." In terms of investment in resources, Hoffman Equipment has already hired additional technicians, added roughly $2 million in parts inventory, and purchased new service trucks that'll be available and ready to service customers in early January 2019. The company also has begun training for their own ‘Heritage Employees' about Volvo, and training Penn-Jersey ‘Legacy Employees' about Hoffman. According to Watters, "one of the most rewarding aspects so far is how well our two teams are meshing together with a lot of excitement and enthusiasm from both sides of the acquisition to support all of our customers, be they owners of Volvo, Manitowoc, or our other ‘Heritage Products' including Case and Doosan." While Hoffman Equipment is ramping up product support for Volvo equipment, Watters is impressed with the manufacturer's commitment to support. "Volvo is really committed and invested in after sale product support," he said. "They are fully invested in making sure the customer experience is a fantastic one and on top of that, the machines are renowned for their quality. They have a telematics system so superior to anything I've ever seen. I am really excited to get started with that and to offer that to all our customers." Watters is proud to be responsible for continuing the lineage and heritage of Penn Jersey Machinery name. "The heritage of Penn-Jersey dates back to Road Machinery," Watters said. "When you think of the company, the brands and names of the owners of the company that we are acquiring … Road Machinery became Shelton Witt, which became Strongco, which became L.B. Smith, which became Volvo, then Flagler, and now finally it's Hoffman Equipment. Throughout all of those ownership changes, there remains core employees who go back 35 years with the company. These people are well recognized in the industry, who know what they are doing, and couple those traits with a great work ethic and remain customer-focused and customer-driven — we want these people to be part of our team." As a result of this, Hoffman Equipment has grown from 85 employees prior to the acquisition to about 150 post-acquisition. "It's quite an increase in personnel," Watters said. "They are good people and I am already impressed by them and happy to have them aboard." Cranes will continue to be a Hoffman Equipment mainstay with Manitowoc, Grove and National. For the time being, Hoffman Equipment will continue to carry its other major lines, but Watters admits some uncertainty that all of the existing lines will remain. "But no matter what happens," Watters began, "we will absolutely ensure that our existing customers receive full support for whatever machines they have ever purchased from Hoffman Equipment." "What's really nice about this transaction, or this acquisition, is when it's over, we'll be able to offer a laser focus on our Volvo brand, in tandem, with our Manitowoc Crane Group brand, throughout all of our locations," Watters said. "This focus will improve our efficiency and our capabilities. Take technicians for example: all of our technicians will now be operating on the same type of machines," he said. "The training that is required today is so intense, but we will be able to have more highly trained technician specialists within the Volvo product line; we'll be able to focus on depth of training instead of breadth of training, which will dramatically improve our skills and ability to get our customers up and running faster. At the end of the day, success in this industry is totally dependent upon our ability to provide our customers with the best Product Support possible." And Watters has Philadelphia, Pa., on his mind, which will be served via the Lionville branch. "We had the Manitowoc line in Philadelphia when we first took on the line in 2003," he said. "We had it for about two or three years before we gave it up when we acquired Stephenson Equipment's branch in the Hudson Valley [New York]. We had a great experience in Philadelphia," he said "and we think that we were very well accepted here. We still have a lot to learn, but we have a good foundation to build on and we are really excited to re-engage the Philadelphia market." As 2018 closes, 2019 looks to be an exciting new year for Hoffman Equipment. "Volvo is a great manufacturer and though we have only been with them for a month now," Watters said. "it is very clear to me that they are good people who do what they say they are going to do — it's been a pleasure so far. And, not for nothing, we've already sold a fair amount of machines in the short time that we have had the line." "We remain customer-driven and customer-focused, and the culture of Penn Jersey has always been the same. This merger will be successful because in the end, that is what matters."